Do you read the 'A Playful Day' blog? Kate is running a hastag today #makegoodfeelgood to support Mind which is a charity that supports people with mental health issues. Knitting has helped me deal with chronic pain and depression so as well as posting on Instagram I thought I would post a bit about my story. First, why not read A Playful Day's blog post about why she's hosting this initiative today then come back and read my story. Growing up in Norway I learnt to knit as a very young child and knitting was always a very important part of my childhood and teenage years. After I moved to the UK at the age of 20, I knitted a lot less and when I had my children I didn't knit for a few years. When I was 14 years old I was in a car accident and suffered a whiplash injury. I started suffering from headaches and frequent neck pain for which I had to take painkillers on some days. A year after the accident the pain got bad enough that I started physiotherapy and chiropractor treatment. The pain developed into chronic pain but it was managable. I didn't suffer from constant pain and I didn't have to take painkillers every day but I did have pain on a daily basis. Fast forward to 1999. By this time I has two young children. Vanessa was 3 1/2 years old and Emily was 18 months old. Simon and I were in a car accident on our way to do our weekly grocery shopping. The accident was significant but not serious enough to need immediate medical attention. Later that day the pain in my neck started to increase and the next day I was in a considerable amount of pain. I was signed off work the next day and I stayed off work for 6 months. I tried going back for 2 months but was signed off again as I just couldn't cope. After another 6 months I was given ill health retirement. I was in severe pain every day and took strong painkillers. About a year after the accident I was also diagnosed with Malignant Melanoma (the most serious form of skin cancer). I was very lucky and the mole was removed very quickly and the cancer hadn't spread so I didn't need any more treatment, just regular check ups for the next few years. But this also contributed to my mental health decline. I became very depressed and after an appointment at the pain clinic I was prescribed anti-depressants which actually made me more depressed over time. After a few months on these anti-depressants I got to the point where I was feeling like a zombie all day. I had no energy and felt extremely depressed. After taking the kids to school and nursery every day, I just sat at home watching day time TV as I had no energy. Around that time, the girls asked me for furry scarves (knitted in a fake fur novelty yarn). I hadn't knitted for a few years but I popped in to our local Wool Shop and bought some yarn and needles and that winter I knitted over 50 scarves in fake fur novelty yarn. I gave them to friends and family for Christmas. I knitted lots to sell at craft fairs and on Ebay. I got bored with scarves and moved on to knitting hand bags in novelty yarn and felted hand bags. I wasn't very good at reading and understanding British/American knitting patterns, so I made up my own designs. One of my early designs was this bag I knitted for a friend. Getting back into knitting gave me a sense of achievement. I felt like I was doing something. Instead of just sitting around all day doing nothing, I sat around all day knitting and it made me feel good. I made things I thought was nice at the time. I discovered online knitting forums and eventually Ravelry. 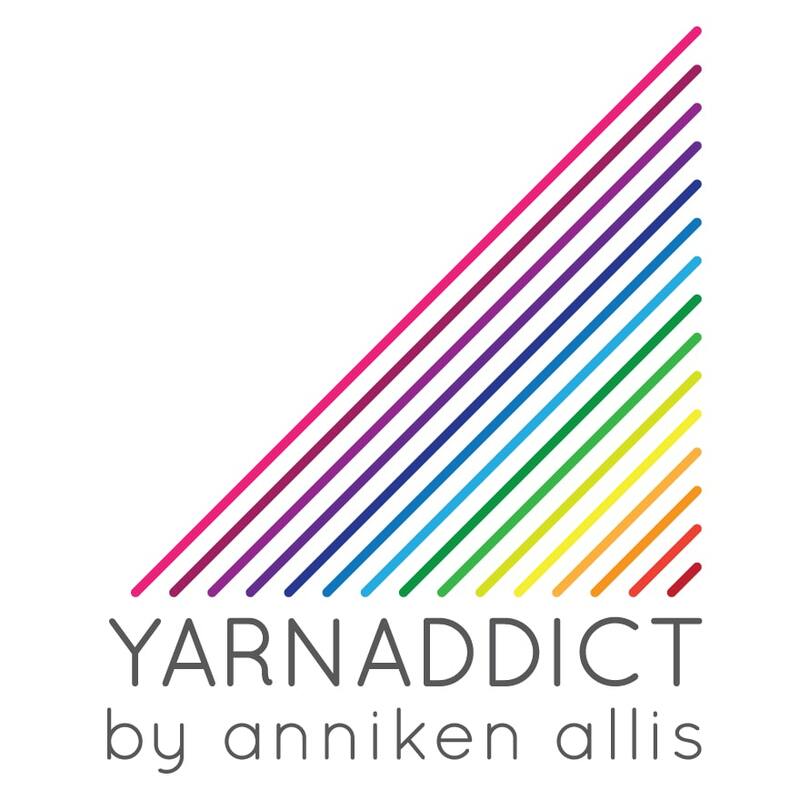 I started blogging about my knitting. And eventually I started hand-dyeing yarn and designing knitting patterns. And I came off the anti-depressants. The anti-depressants I was on made me feel more depressed and I had more energy as soon as I came off them but the doctor was concerned how I'd manage without medication. I've never taken anti-depressants since and I think knitting has a lot to do with it. Designing gave me the mental stimulation I craved. Having to give up my job and not being able to return to work when my girls went to school, like all my friends did, made me feel useless. I felt like I wasn't contributing to society. Designing and knitting challenged me, I made beautiful things, I made friends online. And eventually it blossomed into a career and I was able to come off disability benefits and work properly. I still suffer from chronic neck/upper back/shoulder pain. I'm in pain all the time, despite taking a large amounts of medication every day (I take the max daily dose of three pain killers (one is a controlled drug), anti-inflammatory and pills to help me sleep. I also take medication for an underactive thryroid. I take 24 tablets every day and I have done for about 15 years now. Yesterday's class at Sitting Knitting. After teaching for a day, I'm in increased pain and have to take it easy the next day or two to recover. Today is one of those days. I'm in a lot of pain after teaching in Birmingham yesterday. It was 3pm before I felt well enough to sit down at my desk but I've been knitting today and sewing up a sweater. I can knit, even when I'm in pain, if I sit in a comfy armchair that supports my back and head. If I hadn't been able to knit today I think I would have become very down and felt useless. And although, I do feel guilty for not spending more time at my computer today, because I have a ton of work to catch up on, I do feel that I've achieved something today. When I work at my desk; writing patterns, dealing with e-mails, blogging, social media, admin etc I can only work for max an hour and then I had to take at least a 30 minute break. Some days I can only work at my desk for 30 mins at a time, with an hour break between each stint. When I take a break, I knit. That's why I get a lot of knitting done but struggle to keep on top of admin, e-mails etc. I can't work for anyone else. Who would give me a job when I have to take a break every hour, when I can't work some days because I'm in too much pain? I'm so thankful that knitting and designing has turned into a career. I came off disability benefits, I contribute financially to my family and I do something I love and I feel a sense of achievement. My proudest achievement is writing my book, Beaded Lace Knitting. I had wanted to write a book for several years but I was worried about taking on such a big project but I did it. Yes it was hard, yes I struggled getting all the work done in time because of the chronic pain I suffer from but I did it! I do get depressed at times. I need to pace myself carefully which I'm rubbish at. I take on way too much work. But I've been off anti-depressants for many years now and I thank knitting and my faith for that. One of my current wips has kept me company today. I do have a strong Christian faith. I became a Christian a few years after my second car accident and after I started knitting and designing but I still believe that God provided this career for me and I'm so thankful. This blog post has become longer than I intended but it feels good to share my story. Why do you knit? Has knitting helped you overcome problems? Maybe not as serious as depression but perhaps knitting has helped you over come difficulties. Helped you make friends. Given you something else to think about when suffering from illness. Why not share your story by using the hashtag #madegoodfeelgood. Thank you Nicola for sharing your story. Yes lots of crafters have a similar story! I learned to knit as a child and have knitted on and off ever since - cardigans etc mostly. I have very long arms so it's the only way to get sleeves long enough. Then I had children so knitted jumpers for them for several years. When picture knits were 'in' during the 80s we each had one, the boys, husband and son, having trains on theirs. More recently I discovered sock knitting and knitted some for me. Mother was interested so I started knitting socks for her, then sister, niece, sister-in-law and, very occasionally, husband. Now I knit socks year round thus providing parcels of five or six pairs of socks for the women in the family. During the past two years I've taken up knitting sweaters again - for me mainly as I didn't have any that fitted. Something to do with weight gain being on antidepressants! I'm still on antidepressants, winter is not the time of year to try quitting, but have also knitted sweaters for Mum, husband and niece. The great thing about sweaters is that they take a month to six weeks to knit and they sit over your lap and keep you warm. The good thing about socks is that they take less than a week to knit and they don't smother you, so are ideal summer knitting projects. Then there are very few TV programmes which cannot be improved by the addition of some knitting - complexity depending on the degree of concentration required to follow the programme! At this time of year it can get a bit hectic, but I enjoy having something on the needles and get a bit 'itchy' when I haven't. Hmmm, what are the projects for January? Thank you for sharing Bronchitikat. Winter is definitely not a good time to try to come off anti-depressants. I'm much more prone to low moods during the autumn. November/December being my most dangerous months. I think it's because it's so dark/miserable weather. After Christmas I look forward to summer which helps. I need to move somewhere hot!